Design history celebrates key works. Some have an immediate influence, marking a leap in the profession and identifying a period. Others, remarkable for their innovation and brilliance, have no immediate successors. Such is the case with the book La Cantatrice chauve (The Bald Prima Donna). Designed by Massin (who stopped using his first name, Robert, in the 1950s), this visual record of a theatrical production of Eugène Ionesco’s play published in Paris in 1964 is acknowledged in every account of the period’s design and typography. Created in the later stages of pre-digital graphics, La Cantatrice chauve is conspicuous for its sustained integration of image and word as an expression of the text. Only today, with the designer’s freedom to manipulate text and image on the screen, can we begin to understand its long-dormant legacy. Beginning work as a designer soon after the Second World War, Massin belongs to that generation whose output has spanned two technological revolutions: in typesetting, from hot-metal, through photosetting to digitisation; in printing, from letterpress to lithography. Following a period of involvement with the book clubs’ productions of the 1950s – one of France’s distinct contributions to graphic design – Massin was for over 20 years art director of Gallimard, the publishers responsible for La Cantatrice chauve. But Massin is not only a designer and art director. He is author of historical studies, novels and autobiographical writings (published under a pseudonym); he has written an account of Zola as a photographer and a documentary biography of Dostoyevsky. Much-thumbed copies of his compendium Letter and Image (La Lettre et l’image) can be found on the shelves of many design studios. Here, Massin shares with the reader his enthusiasm for the diversity of letterforms: in monastery manuscripts, press advertisements, Cubist collages, Arabic calligraphy, Dadaist typography, all kinds of book covers – indeed, wherever the author looked and pointed his camera. Gallimard has produced several new editions since the book first appeared in 1970. At a time when Helvetica and Univers were the norm, it raised questions about the expressive power of letterforms, a subject considered academic and amateur by many designers. But at the height of structuralist concern with the text, semiologists took note, and the book prompted Roland Barthes to write an essay of admiring bewilderment. The letter was a ‘contradictory signifier’ – on the one hand it was precise, so that we talk about the ‘letter of the law;’ on the other it released an endless flow of symbol and metaphor. The letter seemed to have its own meaning, independent of the text. Massin was born in a country village to the southwest of Paris in 1925. His father, a monumental mason, allowed him to cut his name and address in stone at the age of four and a half. In his book L’ABC du métier, a visual autobiography of his graphic world, his 1930s childhood is recalled by the classic commercial images and trademarks of the day: Michelin’s Bibendum man; Kub, the red and yellow bouillon stock cube; the St Raphaël waiters. As the Second World War ended, his formal education over, Massin made unsuccessful attempts to become a theatre reviewer. Disheartened, he travelled abroad, doing odd jobs and trying his hand at freelance journalism. After his return to Paris in 1948 he found a job as editor of a book club’s monthly newsletter. Because he had to do a paste-up of these pages, Massin became a designer. Knowing nothing about typesetting, he went to one of the firm’s printers, where he was placed in front of the cases of metal type, a composing stick put in his hand and he started to set his own name in type: the way a generation of typographers and designers began to learn their trade. Le Club du Meilleur Livre, where Massin worked from 1952, was one of several book clubs which helped to meet the demand for books after the years of Nazi occupation and a decade before television. Club members were offered a choice of one of four books each month – classics, translations and out-of-print works that reflected the enthusiasms of the publishers. The books did not have to compete for attention on bookshop shelves so there was no need for eye-catching jackets. Each volume could be a coherent, totally designed object, its designer responsible for every aspect of its production, not just typeface and layout. As published by the clubs, the book became a ‘livre-objet,’ described by Massin as ‘akin to an art work, a sculpture, a vase, a piece of furniture, and with a life independent of its textual content.’ The book was ‘no longer this rectangular parallelepiped as thick and inert as a brick, but something living; while printing was usually thought of as existing on the flat surface, we made a point of the book’s being three-dimensional.’ This object was not just to be seen, but handled. The binding material, protected by a loose sleeve of transparent plastic, could be anything that related to the content – velvet, sacking, wallpaper, wood veneer and butchers’ wrapping paper were all used. New typefaces were of no interest to Massin and his collegues. They wanted to ‘faire du neuf avec de l’ancien,’ to make something new with the old. Nevertheless, this did not prevent Massin making old with the old when trying to match typographic and literary expression in the club’s series of French classical literature, ‘Le Nombre d’or,’ designed as skilled pastiches of period typography. In 1958 Massin joined the mainstream of commercial publishing at the long-established Gallimard. The company’s output was huge, with 10000 titles in its catalogue. 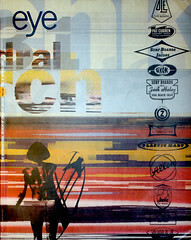 Massin became art director in 1960 – directing, at first, only himself. He summed up his task in three words: retain, restore, renew. The logotype ‘nrf’ (Nouvelle revue française) was retained and redrawn. The white covers of Gallimard novels – the author’s name in black, the title in red, all centered in Didot capitals and typeset at Deberny & Peignot – were retained and fine-tuned. The paperback cover became an illustrated label rather than an integrated graphic design. Massin’s covers for the Folio series lack the diverse, inventive graphics that his earlier jacket designs share with New Directions and Grove Press paperback covers in the US (by Paul Rand, Roy Kuhlman, Ivan Chermayeff and Rudolph de Harak, for instance). Yet some of the book club outlook remained. Massin saw the book as a piece of industrial design, like ‘a locomotive, a sewing machine or a coffee mill, the aim is the same: to give a pleasing form to an essential object.’ He said he wanted to make these books so that they would be both ‘read and kept… to look as though they had a noble pedigree.’ Popularity was not to be confused with vulgarity. Massin worked intermittently on less commercial projects. His first important single piece of design at Gallimard was an edition of Raymond Queneau’s Exercices de style. Queneau’s book examines narrative styles by repeating the same very short story in 100 different ways. In attempting ‘a literal expression of the text (mainly limited to the titles),’ Massin displayed his skill with eccentric type forms, supplying each variation of the tale with a heading which suggests the narrative form that follows. Derived from the content, the type style becomes part of the expression of the text’s meaning. The letters are not decoration, but unified text and illustration. Massin’s Exercices de style was a further demonstration of Faucheux’s idea of ‘making connections between the text and its graphic expression.’ Since Faucheux had himself produced a book club version of Exercises de style in 1956, there was, for Massin, an element of rivalry as well as homage in the project. Two years after Exercises de style came Massin’s graphic production of Ionesco’s play La Cantatrice chauve, a project initiated as much by Massin’s passion for the theatre as by his compulsion to experiment with the expression of a text. Avant-garde in 1950, La Cantatrice chauve is now considered a classic of French literature and has been on the Paris stage continuously for the past 35 years. Offering a French view of petit-bourgeois life, represented by the comings and goings on stage of two English couples, it belongs to the Theatre of the Absurd, mocking traditional theatre. A play without a plot, its dramatic effect depends on the language and on a relentless accumulation of banality which descends into hysterical realism and tragic farce. Massin saw the production on stage 20 times and recorded it on audiotape. He wanted the book to be an exact record. Ionesco’s characters, intentionally commonplace, speak in clichés; as their typographic equivalents, in a clear use of the ‘personality’ of typefaces, Massin chose conventional types in everyday use. Mr Smith talks in Plantin roman, his wife in italic; Mr and Mrs Martin speak in Grotesque 215 and Gill Italic; a fireman in a semi-bold Egyptian; Marie, the maid, in Cheltenham Bold. Massin introduces the actors in a cast list with their black and white photographic image, their name in the typeface in which they speak throughout the text. Ionesco allowed Massin to minimise the stage directions and eliminate punctuation, except for question and exclamation marks. In order to reproduce the effect of some parts of the play as perfrmed on stage, Massin exaggerates the characters’ expressions, as though they were overacting. As he tells us in L’ABC du metier, in using changes of scale and zoom effects, long shot and close-up, he was adopting techniques from the cinema and the comic strip. Massin goes to extreme lengths to carry out Ionesco’s dramatic intentions: in one case a scene lasting two minutes on stage extends over 48 pages, a quarter of the book. The play moves towards a climax in which the players shout over one another, coming to blows. ‘At the end of the piece, the rhythm speeds up, images and words jostle and shove one another in a sort of verbal frenzy which finishes in language being demolished: as if it were returning to its roots, reduced to onomatopoeia or single consonants and vowels. On the stage, the characters speak one on top of the other, at the same time coming to blows: the words deliver the punch (and then, at the end of the day, after they’ve been helped by the images, the words win, and that’s the end of the images).’ The graphics of Massin’s brilliant finale express the violence of the action yet retain the readability of the text. Today, Massin recalls all the details of the graphic technique. The photographs of the actors were taken against a white wall in Gallimard’s offices by Henry Cohen. Even Massin himself is amazed at the hours spent on the design work, mostly at night. Using photostats of the photographs and projecting proofs of the type, all set in one text size, through an epidiascope, Massin drew same-size layouts for each double-page spread on tracing paper. ‘Posterised,’ black and white, halftone-free like the text, the images were combined with the type, giving a consistent graphic unity and more importantly helping to integrate the representation of what spectators saw and heard at a performance. The introduction of rub-down lettering such as Letraset brought Massin a further means of making text under his own control. In 1966, for his second Ionesco work, Délire à deux (‘two’s madness’) the text was made in transfer lettering from two alphabet designs by Massin himself. In a foreword, the designer describes the ‘action’: ‘Shut up in a room, a man and woman are arguing while around them a riot is building up. Their words, their insults, their shouts are punctuated by explosions: shots, grenades going off, explosions, and finally, the fireworks celebrating victory.’ The male voice is Garamond; the female Garamond italic, drawn at five angles including one sloping backwards, a ‘reverse italic.’ Here, using what he called ‘aural calligraphy,’ Massin translated the human voice with different weights of type, and by using ink blots and various graphic accidents. In the same year he designed the typographic orchestration of Jean Tardieu’s vocal sextet Conversation-Sinfonietta, assigning one-sixth of the page horizontally to each voice at a height that corresponded with its register. Massin remembers being typeset at Studio Hollenstein in Paris by photographing lines composed of individual letters on miniature tiles of card, line by line. What of Masin the designer now? Accompanied by his bulldog (a reminder of the Anglo-Saxon ironies of La Cantatrice chauve? ), he freelances from a room in his flat in Montparnasse. In the final words of L’ABC du metier in September 1988 Massin set himself a challenge: ‘From tomorrow, I’m going to start layout on screen.’ The result is that he has reversed his earlier dictum, ‘to do something new with the old,’ and using the Macintosh has done something old with the new. The machine has allowed him to complete a longstanding project, a version of Cocteau’s Les Mariés de la Tour Eiffel (‘the wedding on the Eiffel Tower’), a musical satire of bourgeois attitudes first produced in 1921. In 1966 he began extending the 20-page text as a homage to Cocteau, who had died three years earlier. These initial pages, created by pasting up lines of type letter by letter, were scanned into the Macintosh. Now, almost 30 years later, the work is printed – in black on 16-page sections of coloured paper. Les Mariés is an indulgence belonging to the period of Massin’s earlier interest in letterforms. What began as a labour of love, a technical tour de force, has become a nostalgic series of exercises in style. Yet it would be wrong to suggest that Massin has not exploited the Macintosh, which he regards simply as a new tool. ‘The Mac isn’t talented,’ he says – like any tool. He enjoys its speed, and the opportunities it provides for modification of a form and refinement of a typographic idea. Manipulating text (standardised in Helvetica) and image, with little or no preliminary drawing, he has supplied artwork on disk at two-day deadlines for more than 50 posters for the FNAC chain of bookshops. Massin has also been at work recently on an identity for the National Theatre in Strasbourg. In drawing the letters TNS for the logo, he realised that he was merely making a poor rendering of the elements of Cassandre’s Bifur typeface. (The more usual form of the type had already been used by Antoine Vitez for the Chaillot National Theatre.) So Massin adopted the barest form of Bifur, the version used as an illustration in Faucheux’s 1952 article, ‘the only truly new form since the sixteenth century.’ Seen from one point of view, Bifur embodies the purist machine aesthetic of Ozenfant and Le Corbusier; from the other, it is the most debased example of style, its form bearing no relation to the function of readability. Massin’s designs and writings concern themselves chiefly with the tensions between the inherent expressive quality of a typeface and the words – the writer’s or client’s information. Contexts change criteria: with the title on a poster or paperback cover (or a logo), it is visibility; with a book’s text, it is readability. Massin’s considerations have always been directed at the total graphic expression: readability and style are part of the same task of finding a means to convey the author’s text.